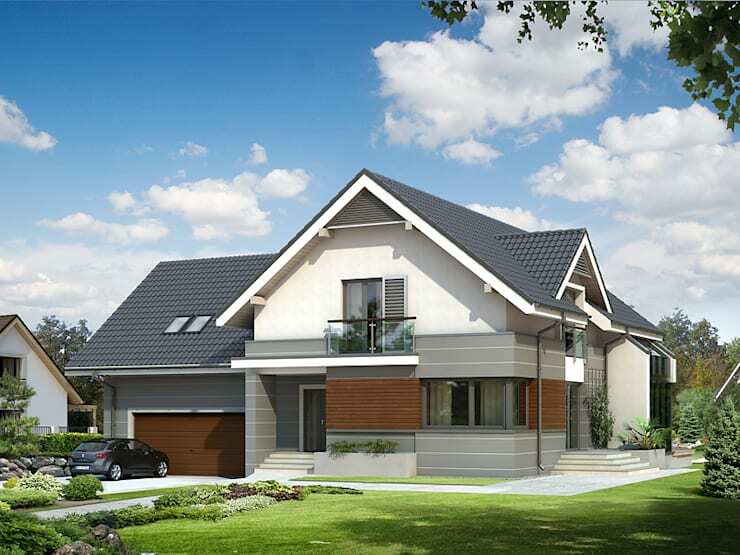 We are in Poland today, all set to explore a modern and stylish house with a hint of traditional design. Done up in classic neutral hues like white and grey, the house Jaspis 6 features wooden elements for warmth and rusticity. Lavish amounts of glazing and a gorgeous yard help the inhabitants to receive ample sunlight and connect with nature. The interiors are bright, spacious and stylishly decked for a cheerful and comfortable living experience. While the common areas are on the ground floor, the upper storey is reserved for the sleeping spaces. Credit for this tasteful creation goes to the architects at Biuro Projektowe MTM STYL. 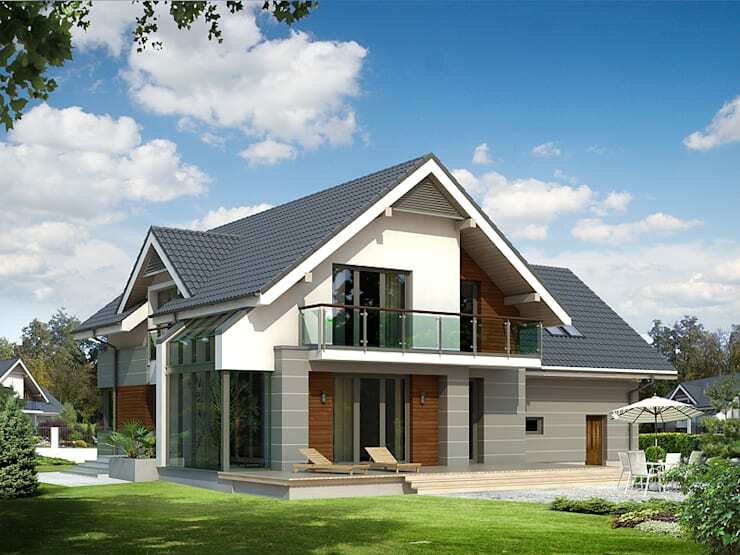 Quaint dark grey roofs and exterior walls in white, light grey and wood make for a truly pretty facade. The slope of the roofs celebrates countryside beauty, while wooden elements make for a warm appeal. A neat garage, a small but sunny balcony on the upper storey and a stylish stairway leading to the entrance make this residence inspiring. Large glass doors help the backside of the house to open up to the manicured garden with ease. Recliners and a cosy dining arrangement allow you to laze around sunbathe or relish open air meals. The upper storey balcony on this side is much larger than the one we noticed before. With glass balustrades, the balcony looks stylish and airy. 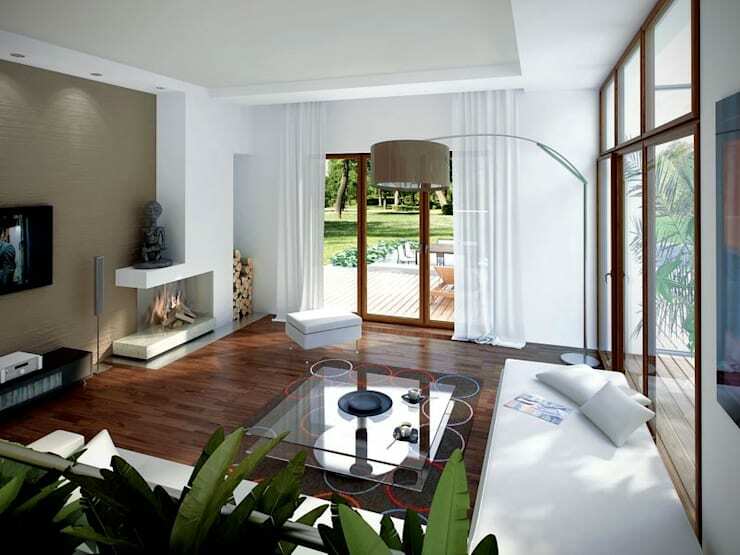 Warm wooden flooring and large glass windows make the living space cosy, bright and cheerful. 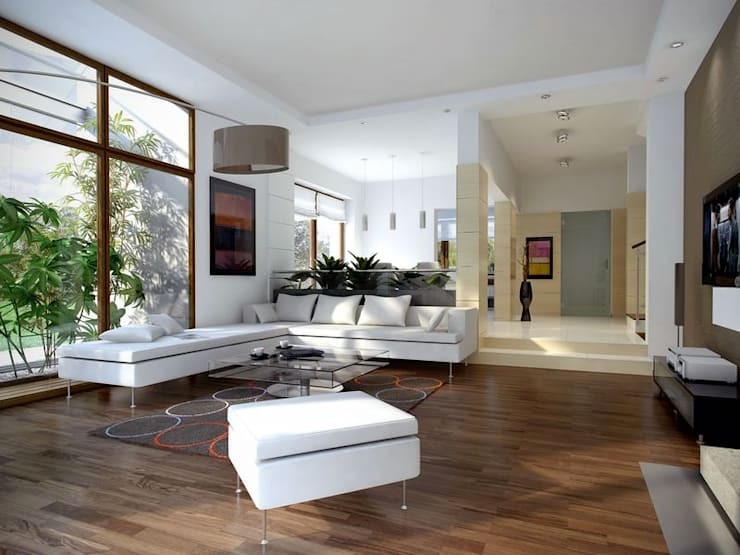 The white walls are nicely complemented by the sleek sofas. A trendy fireplace has been built into the wall adjacent to the TV unit to create a warm and toasty corner during winter months. 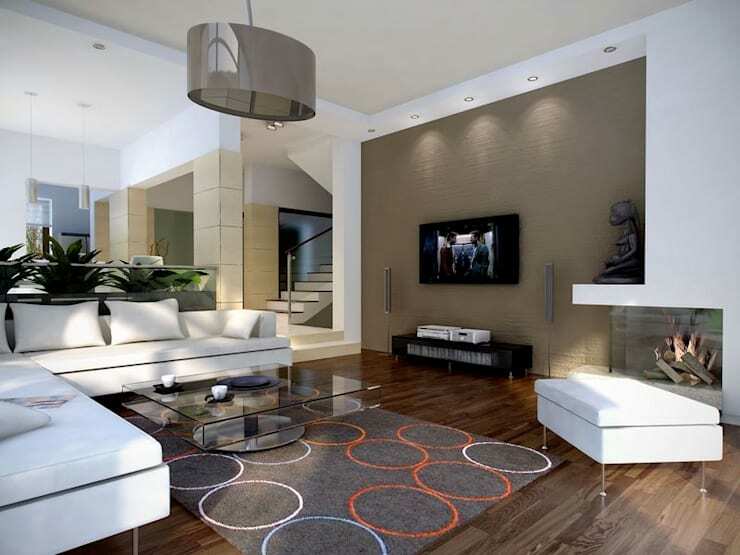 The wall holding the TV is in dark beige and goes well with the rug with circular patterns. The coffee table is all-glass and a stunning addition here. The living area overlooks the sunny yard and lush green garden through the tall glass doors, making for a refreshing experience. Soft white drapes lend a dreamy feel. Don’t miss the tall niche in the corner next to the fireplace, which has been reserved for storing logs. Modern and sleek white furniture and proximity to large glass windows make the dining space stylish and cheerful. It is subtly demarcated from the living area with the help of large white floor tiles and a sleek planter which resembles a half wall. 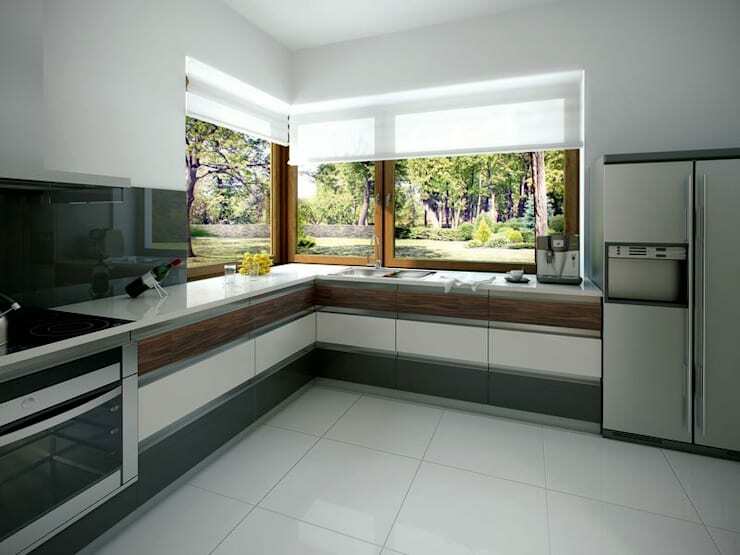 White and dark grey again join hands to make this spacious kitchen elegant and classy. Smooth minimalistic cabinets and trendy chrome appliances make this the perfect space for cooking homely meals. Large glass windows bring in the sun besides offering views of the outdoors. 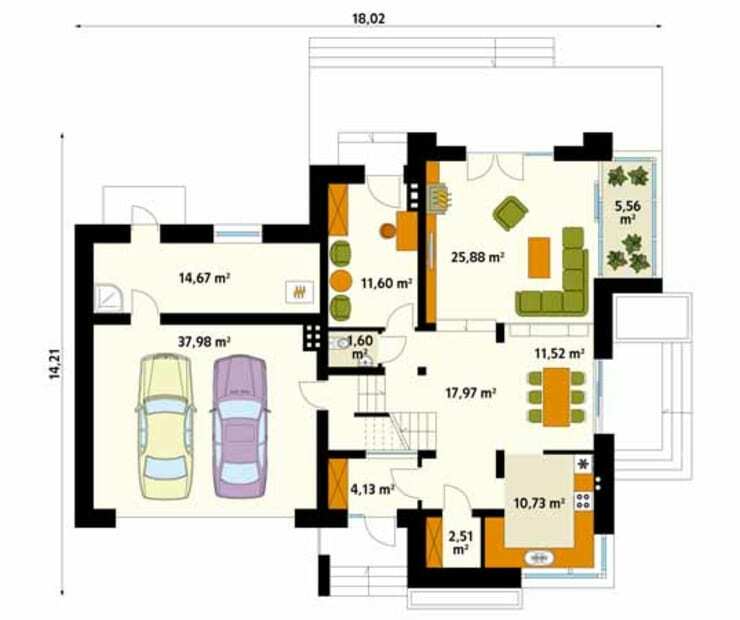 The ground floor as you can see from this plan, comprise of a living area, dining space, kitchen, an additional room, the pantry, and a bathroom. The garage is spacious enough for two cars and comes with a boiler room behind it. 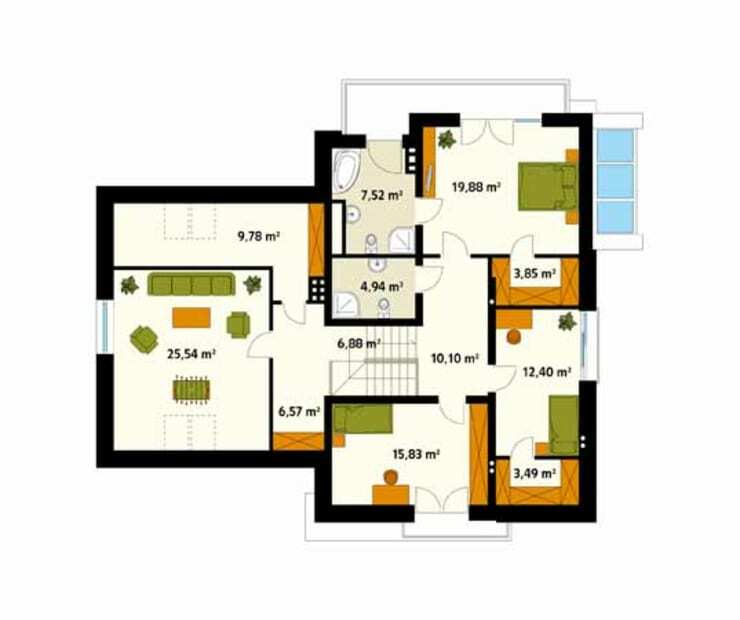 On the first floor are located three sizeable bedrooms, two bathrooms, and a dressing room to cater to all the private needs of the family. The room directly above the garage acts like a family room where everyone can relax, chat and share dreams.